Beach Front Silent Disco by Buck Walsky (re-creation of his Burning Man art installation on the front lawn of the Anchorage Museum). Photo from the Anchorage Museum of Art website. The Land Art Generator is thrilled to be included among several creative practitioners participating at the Anchorage Museum's SEED Lab. We're looking forward to gaining a more in depth understanding of the climate issues facing urban and rural communities in Alaska and working collaboratively at the intersection of energy, creativity, culture, and environment. SEED Lab puts creative practitioners in service of and in partnership with the community in proposing solutions to challenges facing Northern places, people and climate and in establishing the North as a catalyst for change. SEED Lab programs and activities focus on creative and critical thinking as a way for the North to be aspirational and solutions-based and to connect people and ideas in ways that have not occurred before—in a radical, relevant and transformative ways. SEED Lab projects are guided by cohorts, which are cross-disciplinary and include creative practice professionals, community change agents (residents), and other experts. Anchorage is host to some of the key issues facing the globe. As a Northern community, we are transforming environmental, social and economic challenges into opportunities that potentially can be shared with communities around the world. The first-place winning design is a perfect example of this new socially-relevant approach to clean energy infrastructure. Light Up by NH Architecture incorporates solar, wind, and microbial fuel cell technologies to produce 2,220 MWh of clean energy annually for St Kilda in the City of Port Phillip, or enough to power nearly 500 Australian homes. 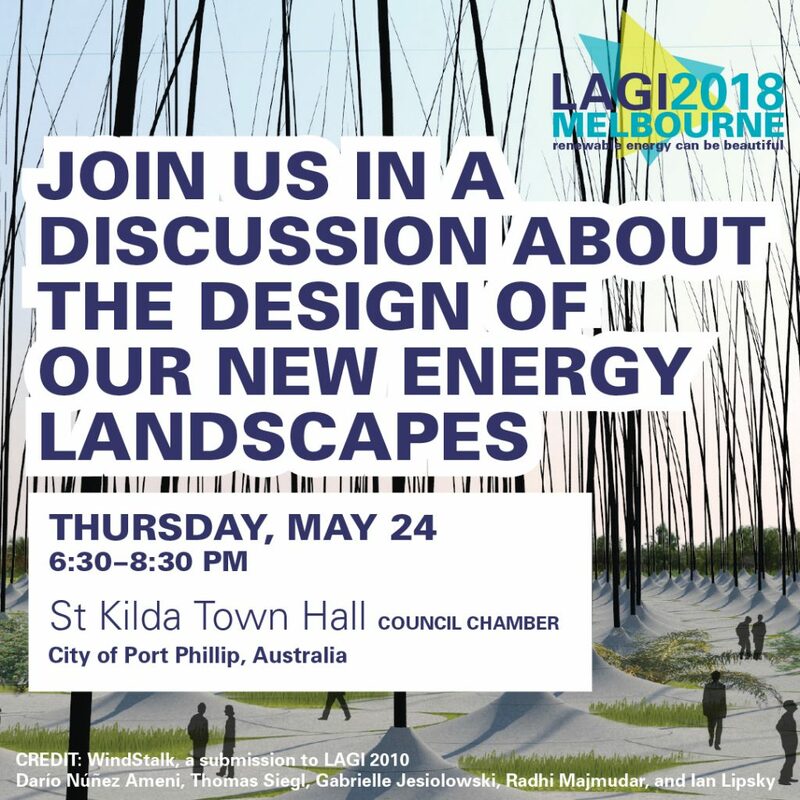 David & Sue talk to Jodie from the Land Art Generator Initiative & Martin from NH Architecture about the St Kilda foreshore triangle design which was the winner of this year’s Land Art Generator Initiative (LAGI) Competition. LAGI (Land Art Generator Initiative) 2018 was free and open to anyone around the world, and invited artists, architects, designers, landscape architects, scientists, engineers, and others to submit proposals for large-scale and site-specific public art installations that generate clean energy for a site in Melbourne. You can find out more on the LAGI website. The competition was supported by both the City of Port Phillip and the Victorian State Government. Today the Land Art Generator awarded a local Melbourne team first prize in their fifth biennial design competition. Sponsored by the State of Victoria as part of their Renewable Energy Action Plan, the competition calls for large-scale works of public art that also produce clean energy. The Land Art Generator Initiative (LAGI) combines community-scale renewable energy infrastructure with public art and creative placemaking for the design of important public places. For 10 years, LAGI’s free and open call international design competition, held every two years in a different city, has mobilized collaborative interdisciplinary creative talent across the globe, resulting in nearly 1,000 innovative proposals from more than 60 countries. Available online, this collection of proposals is an invaluable resource for urban planners looking for inspiration: how to integrate distributed renewable energy infrastructure into urban settings where the public can interact with and reflect upon the third energy revolution. More than any other organization, LAGI is helping us all to visualize – to imagine – what our post-carbon future will look like. And it promises to be beautiful. Acclaimed architecture practice Olson Kundig is best known for its spectacular residential works in the Pacific Northwest, yet the Seattle-based firm has embarked on somewhat new ground in its recent submission to the 2018 Land Art Generator Initiative (LAGI) competition. Held this year in Melbourne, the international contest has invited designers to create a large-scale and site-specific public artwork that could generate clean energy for the city. In response, Olson Kundig developed Night and Day, a massive solar sail concept designed to produce 1,000 MWh of clean energy through a combination of solar energy and a hydro battery. In the rendering, the structure looks like an enormous golden wave, spilling from the Upper Esplanade of Melbourne’s St Kilda Beach, crossing a busy road and crashing onto the sand. In reality, it would be a canopy of nearly 9,000 flexible photovoltaic panels designed to connect a shopping and entertainment district with the beach while generating renewable energy. ON OCTOBER 11, THE LAND Art Generator Initiative (LAGI), a biannual sustainable land art competition, announced its first-place winner for 2018. The victorious design is an energy-laced yellow canopy draped like a translucent racetrack across the sky, and intended to hover over a popular park in one of Melbourne’s major urban centers. Micro-Macro-Enviro Radio with host Shawn Robbins on 96.5 FM Sarasota, Florida. LAGI Directors, Elizabeth Monoian and Robert Ferry, talk with Shawn about the Land Art Generator Initiative and the importance of merging culture with renewable energy infrastructure. "25 mesmerizing land-art projects have been shortlisted for the fifth edition of Land Art Generator Initiative (LAGI) competition at St. Kilda Triangle in Melbourne, Australia. The Land Art Generator Initiative design competition called designers, landscape architects, artists to create large-scale public art projects that will be able to produce clean energy for St. Kilda Triangle in Australia. After receiving entries more than 50 countries, the 2018 LAGI jury has narrowed down the competition to a shortlist of 25 entries. The competition, sponsored by the State of Victoria as part of Action 13 of the Victoria State Renewable Energy Action Plan, was open to landscape architects, engineers, artists, designers, and other international renewable energy enthusiasts encouraging participants to envision a clean energy landscape for a post-carbon world—a public artwork that will help to power the city and inspire the future." "Eight Australian teams are among the twenty-five teams whose designs have been shortlisted in the 2018 Land Art Generator design competition. Participants from more than fifty countries world-wide submitted concept proposals for large-scale works of public art capable of producing clean energy for Melbourne’s St Kilda Triangle site." "The biennial LAGI competition seeks the most innovative proposals for large-scale, public art installations that are capable of producing clean energy in sites across the world, from Copenhagen and Glasgow, to Santa Monica, California and Willimantic, Connecticut. In this latest edition, hundreds of participants from over 50 countries submitted designs for St. Kilda Triangle in Melbourne. Now, the LAGI jury has narrowed down the competition to a shortlist of 25 entries. Join us in a discussion about the design of our new energy landscapes! The Land Art Generator Initiative (LAGI) will be holding a public discussion focusing on our transition to a post carbon future and how public art can facilitate this conversation with the wider community. The event will include a panel from varying disciplines including art in public space, renewable energy, and members of our local community. Co-founder and CEO of CLIMARTE and Director of the Art+Environment consultancy. Guy was a lawyer prior to becoming Director of Christine Abrahams Gallery, one of Australia’s leading contemporary art galleries, a position he held for 22 years. He has held numerous arts positions including President of the Australian Commercial Galleries Association, and Board member of the Melbourne Art Fair and the National Gallery of Victoria Art Foundation. a strategic adviser and former CEO of University Services at both the University of Melbourne and at RMIT. He has been an strong advocate for St Kilda Triangle for many years and has worked on behalf of the Port Phillip community as a committee member of the unChain incorprated association. "Imagine the positive impact that large cultural events like the prestigious Biennale di Venezia could have if they encouraged all future pavilions and exhibits to address the critically important role that artists and architects, in collaboration with engineers, scientists and city planners, can and must play to reduce carbon emissions and increase resiliency of the built environment. The Land Art Generator Initiative (LAGI), which organizes a biennial international competition for renewable energy art and architecture, has already been doing this for 10 years." Read more about LAGI 2018, an interview with the LAGI 2014 winning designer Santiago Muros Cortés, and an interview with LAGI Directors Elizabeth Monoian and Robert Ferry in The Architectural Review. Environmental sustainability is at its root about the health, safety, and long-term integrity of the places where we all live, work, and play. 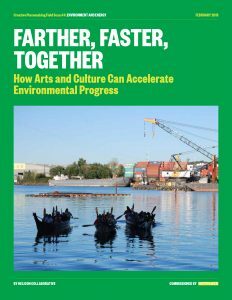 It is with this in mind that ArtPlace is releasing the fourth in our series of creative placemaking field scans: Farther, Faster, Together: How Arts and Culture Can Accelerate Environmental Progress, researched and written by Helicon Collaborative. This investigation touches on the environmental areas of energy, water, land, waste, toxic pollution, and climate resilience and adaptation.